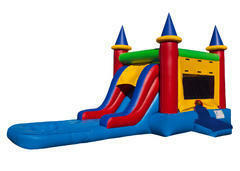 Castle bounce house with slide, pool and also a basket ball hoop inside. Combo bounce house is always a hit with kids. This unit can be used wet or dry. Awesome jumpy house with all age groups.